We recently considered why it’s easy to let our children disobey, and why teaching obedience is important. You all raised so many good questions that we’ve decided to spend several more posts working through the practical elements of teaching our children to obey. Today I want to define what I mean by obedience and then consider the first “strategy” for teaching our children to obey. 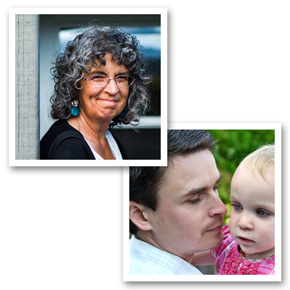 In upcoming posts, Mama and I will write more about appropriate discipline, training helps for younger and older children, and the relationship of obedience, God’s grace, and the gospel. For today, let’s start by defining what we are talking about. 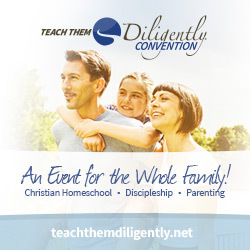 True obedience may be defined as respectful submission to the parent’s authority. It is not merely outward compliance; it includes the heart attitude. (For a detailed picture of what an obedient attitude looks like, see this post.) If outward obedience is rendered with a rebellious or grumbling attitude, it’s not really obedience. A child in a state of surly compliance may have stopped causing trouble, but he is still walking in sin. What is going on in your child’s heart is more important than the behavior he exhibits (Matt. 5:21-28). His behavior serves as an outward indicator of what is going on inside and it can help you see what kind of instruction or discipline is called for. 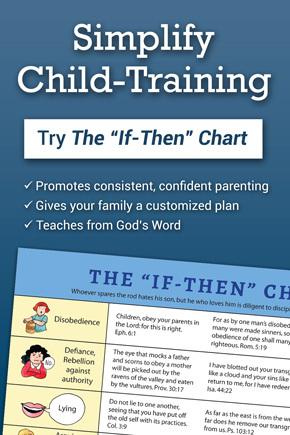 If all we want is well-behaved children, there are many Godless ways to accomplish that, including manipulation, heavy-handed rule, and moralistic legalism. But no, we are raising disciples of Jesus, and we are concerned for our children’s hearts, not just their actions. 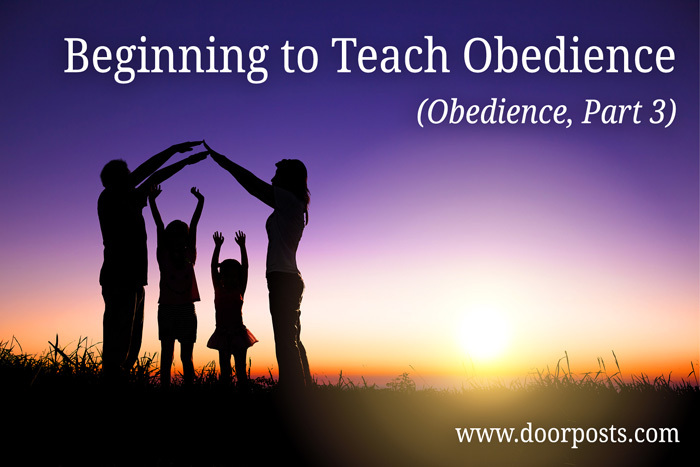 When we teach obedience, we also want to avoid coercion or forced compliance. We aren’t out to break our child’s will; we’re helping him learn to bend it in directions he doesn’t necessarily want to. Even as we give him a choice between staying in his bed or getting up and receiving a spanking, we are still respecting him as a person made in God’s image and teaching him to take personal responsibility for his actions. The first way we teach our children to obey is to obey God ourselves. It would be wrong to crack down and start requiring strict obedience of our children without first examining ourselves. Often God uses our children as little mirrors to reveal areas where we need to grow. How can we expect (or help) our children to obey if we are not practicing what we preach? We don’t have to be perfect before we can teach our children, but we must accept the reality that “more is caught than taught.” We are setting an example that speaks louder than our words. If we are in a saving relationship with God, if we know His love, and if our children see us honestly desiring to please Him as our Heavenly Father, then by God’s grace they will want to walk that same path with us. It should become clear to our children, as soon as they can understand it, that God’s Word is the standard, both for our lives and for theirs. Our parental authority is an authority delegated to us by God. We train them to obey, not to “lord it over them,” but because we’re obeying God, who has given us a responsibility to raise them in the nurture and admonition of the Lord. Obedience will come much more easily to our children if they feel secure in our love. One of the best things we can do is prove ourselves worthy of our children’s trust. Another is to focus on building strong relationships with them. Eager obedience is, in part, the fruit of the relationship we have with our children. Our children will be more inclined to obey us cheerfully if we’re walking in fellowship with them and with God. But if we merely expect our children to obey “because I said so”, if they see hypocrisy in our own life, or if there isn’t an atmosphere of Christian love in our home, trying to require obedience will more likely provoke them to anger. As we train our children in obedience, we must pray that God will draw us and our children into a closer walk with Jesus. Unless God is working in us and through us, none of our efforts to obey or to train our children will be effective. Daniel – Thanks for writing such a thought-provoking post. I’m guilty of not paying as close attention to their heart behavior as to their physical behavior. This is a great series, can’t wait until next week. Lots of good links in this one! How easy it is as parents to focus on the children’s behavior and their hearts than our own. This has been a wonderful series. I am looking to next school year already. I am curious if I would be able to use this in one of our homeschool meetings? We would have break out sessions and I would like to use this in one of them. If I made copies of this for people is that permissible? Thank you so much! Hi Julie, you’re welcome to print and share copies of our posts. If you’d let people know where you got the article and include a link to this blog, we’d appreciate it. Thanks for asking!